Four years after their ground-breaking flights at Kitty Hawk, the Wright Brothers submitted a bid to the U.S. War Department to design a plane for $25,000 in January of 1907. This bid was in response to a previous War Department request issued a month earlier for a "Heavier-than-air Flying Machine." While Wilbur Wright went off to Paris to promote the Wright Flyer, his brother Orville Wright stayed in Dayton, Ohio, to design a plane for the Army Signal Corps, spending over a year on the design and construction. By August of 1908, the plane was ready, and he headed to Fort Myer, Virginia, where the air trials were to take place. To get this contract, the brothers had to prove that the airplane could successfully carry passengers (the Wright Brothers had been allowing passengers to fly with them since May 14rh, 1908), and meet other mission requirements. One of the passengers during the trials would be twenty-six year-old U.S. Army 1st Lieutenant Thomas E. Selfridge. A native of San Francisco, California, being born there on February 8th, 1882, and graduated from West Point in 1903, where he was 31st in a class of 96 (Douglas MacArthur was first), after he received his commission in the Field Artillery, and been stationed at the Presidio in San Francisco at the time of the 1906 earthquake and fire, he was assigned to the Aeronautical Division, U.S. Signal Corps at Fort Myer, Virginia. At Fort Myer, he was one of three pilots trained to fly the Army Dirigible Number One, purchased in July of 1908 from Thomas Scott Baldwin, who was the first American to descend from a balloon in a parachute. Selfridge was also the United States government representative to the Aerial Experiment Association, which was chaired by Alexander Graham Bell, and became its first secretary. Selfridge took his first flight on December 6th, 1907, on Alexander Graham Bell's tetrahedral kite, the Cygnet, made of over 3,000 winged cells. It took him 168 feet in the air, for seven minutes, above Bras d'Or Lake in Nova Scotia, Canada. This flight was the first recorded to be carrying a passenger of any heavier-than-air-craft in Canada. Selfridge also supervised the construction of two airplanes, the "June Bug" and "Red Wing", at Hammondsport, New York, piloting the "Red Wing" of March 12th, 1908, and the "June Bug" in July of 1908. In August of 1908, he was assigned to an official Board responsible for tests of the Army Signal Corps' first dirigible at Fort Myer, Virginia. He made numerous flights in this dirigible before it was officially accepted. 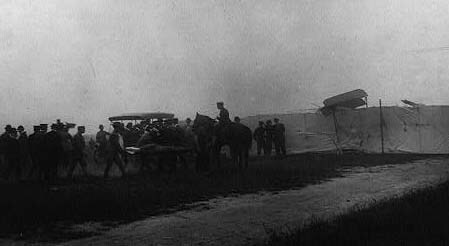 Lieutenant Selfridge's flight in the Wright Flyer was slated for September 18th, 1908. But the Wrights had their concerns about flying with Selfridge, as the Lieutenant was a close friend of the Wright's competition, Alexander Graham Bell. "I don't trust him an inch," Orville wrote to Wilbur. "He plans to meet me often at dinner where he can pump me." 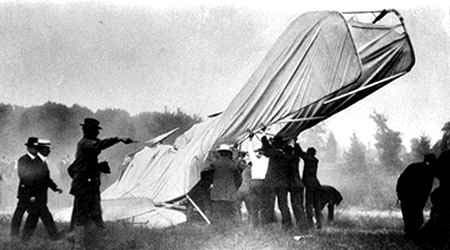 But Selfridge was to leave on September 19th to join Lt. Benjamin D. Foulois in St. Joseph, Missouri, to stage dirigible exhibition flights at a state fair there. So Selfridge asked to go up before his scheduled turn. When one of the two Navy observers, Lt. George Sweet, gave up his place, Wright agreed. 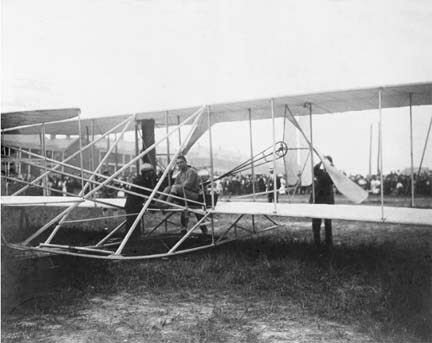 The Flyer, with a wingspan of 36 feet, 4 inches, and a length of 28 feet, had flown with Orville Wright and his first official passenger, Lt. Frank P. Lahm, U.S. Army, on September 10th, at Fort Myer, Virginia. Two days later, Orville took another passenger, Major George Owen Squier, who had written the specifications for the first military aircraft, up in the Flyer for nine minutes. On the 17th, a crowd of around 2,000 people were on hand to witness the flight, some of which were seeing an airplane take flight for the first time in their lives. It was just after 5 PM when Wright said to Selfridge "You might as well get in. We'll start in a couple of minutes." 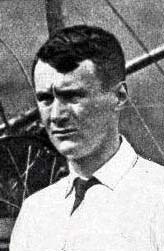 Lt. Selfridge, who was the Wright Flyer's heaviest passenger to date, weighing 175 pounds, complied. Once the propellers were turned, Lt. Selfridge waved to the crowd. At 5:14PM, the weights holding the airplane to the ground (in cause of a gust of wind) were dropped and the airplane was off, slowly lumbering into the air. Orville was keeping his control inputs very basic, and had flown three laps over the parade ground successfully, at an altitude of about 150 feet, when he heard light tapping. He turned to look over his shoulders, but did not spot any problems despite using a new set of propellers for this flight. Ever cautious, Wright begin to shut down the plane's engine, a 39 horsepower Wright pusher, to glide to the ground. But before Orville could shut off the engine, he heard "two big thumps, which gave the machine a terrible shaking. Something flew off the airplane, and then the airplane suddenly veered to the right. Wright was unable to get the machine to respond. He shut off the engine as he continued to try and regain control of the airplane. "I continued to push the levers, when the machine suddenly turned to the left. I reversed the levers to stop the turning and to bring the wings on a level. Quick as a flash, the machine turned down in front and started straight for the ground," Wright said in the accident report. Throughout the flight, Lt. Selfridge sat - silent. The lieutenant had glanced at Orville to see his reaction to the situation. But when the airplane was about 75 feet in the air, it started a nose-dive to the ground. Selfridge began to realize what was about to happen, and cried "Oh! Oh!" The plane, and the two aboard, were doomed. The controls were useless, and the plane smacked hard into the parade ground. A cloud of dust rising from the crash site, near the west gate of Arlington National Cemetery, a awed hush fell over the crowd of speculators, and then - everyone ran over to the wreckage. Both Wright and Selfridge had survived the impact, but were both heavily injured, and pinned inside the Flyer. Seemingly easier to free, as well as conscious, Wright was the first to be extricated from the wreck. Orville yelled to rescuers, "Oh, hurry and lift the motor!" 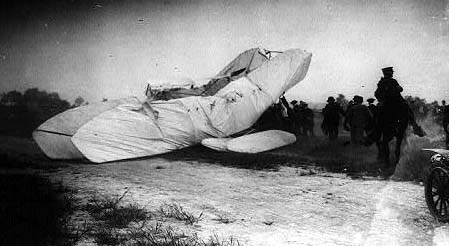 Several spectators raised the crumpled plane and found the unfortunate Selfridge, bloodied and unconscious, pinned beneath the engine. After some time, however, he too was pulled from the Flyer's remains. 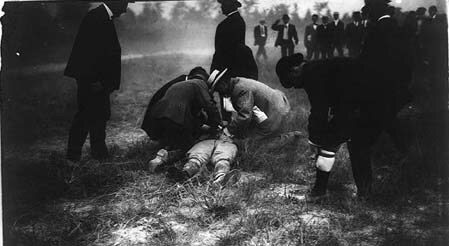 Dr. Watters, a New York physician, was one of the first to reach the crash site, and rendered first aid to the injured men, who were then taken by stretcher to the nearby post hospital. Doctors operated on Lt. Selfridge, but at 8:10 p.m., Selfridge died from a fractured skull, having been thrown against one of the wooden uprights of the framework, and without ever regaining consciousness. Wright was only slightly luckier, having suffered a broken left leg, several broken ribs, laceration to his head, and many bruises. Lt. Thomas Selfridge was buried with military honors at Arlington National Cemetery (Section 3, Lot 2158, Grid QR-13/14). Despite his many achievements he is mostly remembered for one thing - being the first person to die in the crash of an airplane. Orville explained the conclusions to the Army, and the Army was quick to assure him they would extend his contract. The Wrights soon redesigned the Flyer, shortened it by two feet, and adding a more powerful engine, to eliminate the flaws that led to this accident. 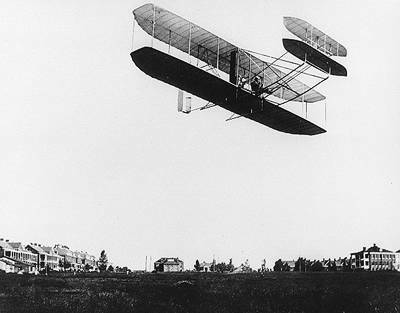 The aircraft was demonstrated successfully at Fort Myer on June 28, 1909, and the Signal Corps accepted the Wright Military Flyer on August 2nd, 1909. The airplane sold for $25,000 plus a bonus of $5,000 because it exceeded 40 miles per hour. On November 3rd, 1909, naval Lieutenant George Sweet got his airplane ride, when he was taken up as a passenger in the first Army Wright aircraft flown by Lt. Frank P. Lahm, at College Park, Maryland. Sweet is credited with being the first Navy officer to have flown in an airplane. In July of 1917, after the government leased an aviation field near Mount Clemens, Michigan, from Henry B. Joy, the field was named in honor of Lieutenant Selfridge. It is now Selfridge Air National Guard Base, located about 30 miles north of Detroit. The West Gate of Arlington Cemetery, near the Flyer's crash site, was renamed the "Selfridge Gate". The gate is only used for funerals held at the Fort Myer Memorial Chapel, with burials at Arlington Cemetery. A wooden fragment from one of the propellers is on display in "The Wright Brothers & The Invention of the Aerial Age" exhibition at the National Air & Space Museum in Washington, D.C.